Shiraz and Syrah are the same red grapes. It is called Syrah in most parts of the world, but is referred to as Shiraz in Australia. The name has stuck and now wineries in the United States label some of their Australian-style Syrah wines, "Shiraz." A serving size of Shiraz is about 5 ounces. According to the US Department of Agriculture's Nutrient Database, there are 122 calories in one glass of generic Shiraz red wine. The calories consist of 4 grams of carbohydrates and 15 grams of alcohol. The calories in a serving of Shiraz are not significantly different than the calories in other popular red wines. A 5 ounce glass of Pinot Noir has 121 calories. A glass of Merlot, Claret or Cabernet Sauvignon each has 122 calories. 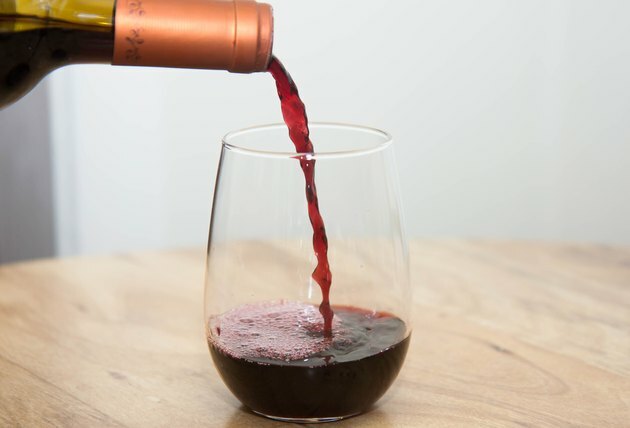 Although a standard serving of red wine is 5 ounces, this is a small pour in most wine glasses. Glasses made specifically for red wine hold 9 to 12 ounces and some hold as much as 14 ounces. If you fill your wine glass, you will consume more than one serving of red wine. How Many Calories in a Glass of White Zinfandel?